It is the season for picking tiny objects. Most folks think about temperature, day length and other weather related things when it comes to “seasons” but for us, sometimes, it is much more relevant to equate seasons with the task at hand. Spring is filled with the harvest of crops that are either very close to the ground or down in it. Spinach, lettuces, broccoli raab, radishes, turnips and the farthest down, carrots. Strong backs are required for the hours and hours of bending over searching for the correct size of root vegetable to pull and bunch. Even then there are only so many of these relatively large objects to pull, on a good day maybe 400 individual turnips to be harvested in an hour. Beginning this week we started the change of seasons to more stand up pursuits but with more tedious consequences. What is he talking about? Sugar Snap Peas and Blueberries. While we do get to stand up while picking them, the harvest time goes on and on. We (five of us) picked peas for two solid hours on Monday morning. Yesterday was the first shot over the bow of Blueberry season with four people picking for several hours, thousands of tiny blue orbs. For the next three weeks our lives will be consumed by the harvest of blueberries. When it overlaps with something else like peas it can be mind numbing. When we first began the transition from mostly blackberries (we had two acres in production at one point) to vegetables and flowers we designed June to be “berry” month. We have never grown the traditional crops that begin in June; squash, beans, cucumbers, potatoes. So I needed something to occupy me from the end of lettuce season and the other cool weather crops, at the end of May, until the beginning of tomato season at the beginning of July. Betsy just won’t let me lounge around the farm without something to do. Our original plan was to have blackberries and blueberries. Several years ago when the last of the large blackberry plantings was waning and the blueberries where beginning to really produce, we had that overlap. We learned that season that there were not enough people on the face of the earth to pick all those tiny objects. When that planting of blackberries was plowed under we decided that June would be Blueberry month only! As it is we still hire an additional four or five people to help us get them all off the bushes and into those little green pint containers. Finally the turkeys got moved to the field. Seven weeks old and tired of hanging around that old brooder building. 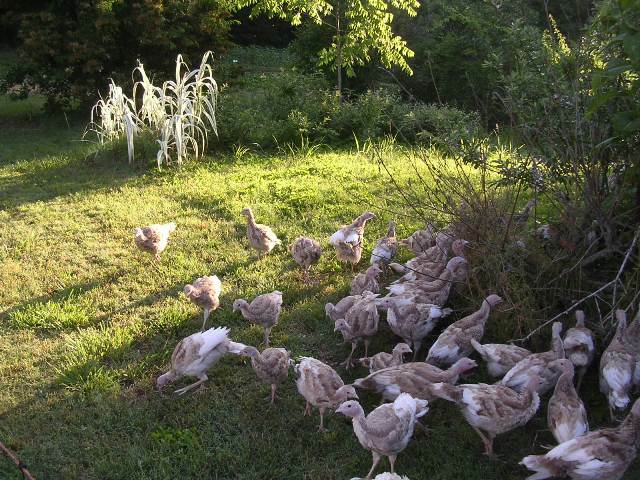 Now turkeys herd pretty well once they get used to it (they actually used to have “turkey drives” to get large numbers to market) but as I have said, the first time you introduce something new to them is always exciting. After several years of trying to herd them from the brooder, the several hundred yards, to their first stop in the fields and having it get out of hand we now carry them over, two in each hand. Yesterday we had six of us to make the job easier. Two catching and four walking them over. They are much happier now, lots of interesting bugs and weed seeds to eat and bushes to run around. Every year we have a misfit in the bunch. Last year it was Buckwheat and the half blind Blue Slate, the year before it was a broad breasted white with a crooked beak that made him look like a pirate. This year it is Shrimpy. Shrimpy is a quarter the size of the others, with shorter legs, but she runs with the rest of them as if there is no difference. No one seems to notice and she is growing just fine only she will never catch up with the others. Some one will be getting a five pound bird for Thanksgiving.